Financial skills are in short supply and are expensive. In the Small and Medium Enterprise (SME) segment this can adversely impact on many businesses. It must also be remembered that in terms of fiduciary duties and responsibilities, directors and senior management are expected to have a firm grip on the entity they manage. Financial skills are fundamental to a business and lacking them can expose directors and senior managers to increased personal risk and liabilities. One way to bridge this gap is by setting up informal audit committees. Who is obliged to have an Audit Committee and what does it do? The new Companies Act requires public companies, state-owned companies and any companies whose Memoranda of Incorporation specify it, to set up an audit committee. Three non-executive directors are the minimum number of members of the committee. Comment on the records and financial reports of the company. Can an informal Audit Committee help your business? Whilst the Companies Act does not require most SMEs to form an audit committee and many SMEs do not even have an audit, entities with limited financial skills can still make good use of this concept. 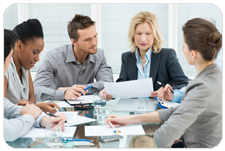 Consider having an informal audit committee which would meet just prior to board meetings. It could comprise of, say, an executive director and one or two retired accountants. The committee would meet with your accountant/bookkeeper and review internal controls, management accounts, budgets, the annual financial statements, and it could manage the audit (if the business has an audit). This committee could also oversee the risk process, future cash flows, governance and any other tasks given it by the board. The chairperson of your audit committee can then report to the board on the state of the entity’s finances and accounts. This will give the owners and senior management feedback on how well the financial department is doing plus advice on company finances. The audit committee is designed to give management assurance that their finances and accounting systems are in order. The costs of paying a couple of accountants for, say, three meetings a year will help reduce risk and potential liabilities, plus it will almost certainly yield a positive return. Speak to your accountant for advice on how to set up and run such a committee. It is often said that accountants speak a strange language. This leads to many people in business not really understanding the income statements and balance sheets that are presented to them. This puts them at a business disadvantage. Why is accounting difficult to understand? Simply put, accounting is reporting to owners and stakeholders how an organisation is performing. But instead of thinking simply, accountants use mathematical equations and language that is not well understood. For example, at a recent meeting of senior financial officers in the U.K., 75% did not get the definition of “expenses” correct. In the U.S.A. an organisation – Accounting Comes Alive International – has pioneered the Colour Accounting system. 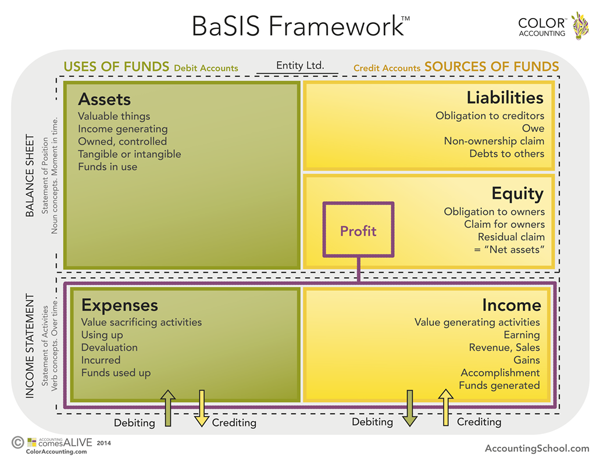 It uses three concepts and the use of a visual colour coded diagram to explain accounting. Structure. A unique quadrant colour framework (see diagram below) is used to illustrate how a business works and how accounting reports this. A business is set up with capital called owner’s equity. The owners can leverage the business by incurring debt. The owner’s equity plus debt is used to acquire assets. The assets plus owner’s equity and debt are the infrastructure of the business. This is also called the balance sheet. The balance sheet reflects assets, liabilities and equity at a defined moment in time. Language. Simple language enhances our understanding. If you look at the diagram below, the creators have used simple words and concepts to explain accounting. For example, the balance sheet is explained in nouns. As said above it is the infrastructure of the entity and this infrastructure is used to generate activities which we call the profit and loss or income statement. Activities. The balance sheet assets are used to create revenue or sales. This is done by “value sacrificing activities” known to you and me as “expenses”. For example, advertising uses up assets (cash in bank) to create demand for the business’ products or services. Expenses and revenue are verb concepts as they are part of the activities which happen over a period of defined time such as twelve months (annual financial statements) or a month (monthly management accounts). This is known as the profit and loss statement or the income statement. The surplus or loss shown in the income statement is transferred to the balance sheet. Have a look at the BaSIS Framework (Balance Sheet and Income Statement) model above; it is called the “Value Cycle” and makes use of colour as it is something we easily grasp. The yellow boxes depict “sources of funds” – in the top right hand column owners contribute funds as equity and can also obtain funds by borrowing or incurring liabilities. Equity and liabilities are used (moving to green in the top left hand corner) to acquire assets which are “used up” (bottom left corner). This is done to generate sales or income (bottom right hand corner in yellow as it generates funds for the business). The difference between income and expenses is the profit or loss which is transferred to Equity (top right hand box). This profit is either paid to owners (dividends) or to third party funders (creditors) who receive interest plus debt repayments. The balance is used to acquire more assets and so the cycle continues. We hope that helps shed some light on how accountancy works and how it adds value to your business! Last year (CA(SA)DotNews November 2013 issue) we warned about the increasing trend in cyber crime. Although there has been a response from business to fight this scourge, there has also been a marked rise in the sophistication of hackers. A recent American survey puts the global cost of cyber crime at $400 billion to $575 billion annually. Remember that SMEs are a primary target of hackers and it is not just money they are after – intellectual property is frequently stolen. The main provisions of the Protection of Personal Information Act (POPI) are due to come into operation soon and this places business at risk of facing a penalty of R10 million or ten years imprisonment should protected data breaches occur. If you haven’t taken action to counter this threat, now is a good time to start. SARS now has a single registration and updating of details process for all taxpayers. This covers income tax, VAT, all payroll taxes and customs and duties. All information will be stored in one central point. So, if your bank account details change, you will only need to do this once as opposed to updating each type of tax. This increased efficiency will assist taxpayers – for example, getting tax clearance should be faster. Previously many taxpayers found that, say, their PAYE bank details have not been updated, necessitating delays in obtaining the tax clearance as you have to “correct” your bank details. As with many new systems, single registration has had teething problems – if you experience difficulties speak to your accountant. South Africa is the second largest exporter of fruit. It is behind China but ahead of the USA and Brazil. We invented coal to oil technology. Sasol took over research done by Germany in World War 2 and now produces 28% of South Africa’s fuel. It has also set up plants in the Middle East and the USA. The most diverse and iconic fossils are found in South Africa. 80% of mammalian fossils were found in the Karoo Supergroup rocks which cover two thirds of the country. Two Nobel Peace Prize winners lived on the same street in Soweto – Nelson Mandela and Archbishop Tutu both lived in Vilikazi Street. We are the only country to have both built and dismantled our own nuclear weapons. Non-provisional eFiling taxpayers must submit their income tax return by 21 November.